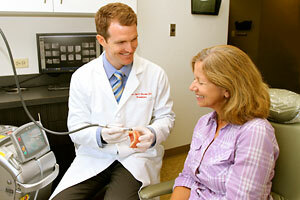 Dr. Henriod treats severe forms of gum disease. Periodontics is the branch of dentistry concerned with the care and treatment of the tissues surrounding and supporting the teeth. Periodontists are specialists in cosmetic periodontal procedures, dental implant placement and periodontal (gum) disease treatment. Mild to moderate gum disease, called gingivitis, is treated by general dentists. 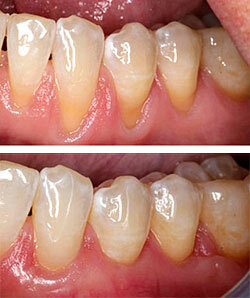 The more severe form is called periodontitis, which is treated by specialists like Dr. Joel Henriod. Dr. Henriod offers a wide range of advanced periodontal care, like scaling and root planing (in which the infected surface of the root is cleaned) or root surface debridement (in which damaged tissue is removed). 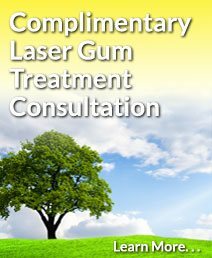 In fact, much of Dr. Henriod’s gum surgery is performed without the need for stitches or cutting the gum as was previously needed before laser gum surgery. Lasers allow Dr. Henriod to gently destroy bacteria in your mouth, as well as to stimulate your body’s natural regenerative potential without the need for painful bone grafting around your teeth. He also performs comfortable laser treatments to fix gummy smiles. 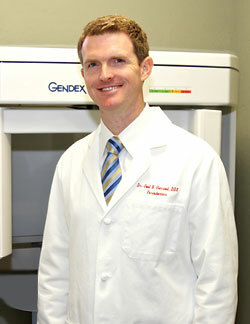 Dr. Henriod is a Diplomate of the American Board of Periodontology. Dr. Henriod is a Diplomate of the American Board of Periodontology. He was certified after passing a comprehensive and rigorous examination process covering all phases of gum disease and its treatment, including dental implants. Because periodontics is an ever changing field, Dr. Henriod takes continuing education classes every year to stay on top of his field. In addition to being board-certified in periodontics he is certified in the LANAP (laser periodontal therapy) procedure and certified in oral and IV sedation, as well. Respected by his peers as one of the top periodontists in the area, Dr. Henriod teaches periodontists and other dentists about technology in implant surgery, bone grafting techniques and minimally invasive gum grafting. In 2011 and 2012 lectured 45 times to dental clinicians from around the world. 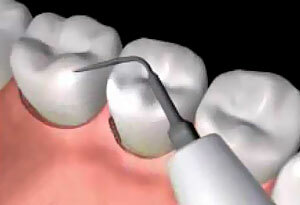 The LANAP procedure is safe and effective in treating gum disease. The Laser-Assisted New Attachment Procedure (LANAP) is FDA approved for treating gum disease because it’s safe and effective. With cutting-edge LANAP there’s much less discomfort during and after the procedure because there is no cutting, packing or suturing required. And it removes diseased tissue without harming healthy tissue. Dr. Henriod is certified and very experienced in this revolutionary laser surgery. For more details on LANAP, click this link. Dr. Henriod will perform an oral examination to look for signs of gum disease. You’ll get an opportunity to discuss concerns, have treatment options explained and get any questions answered. Plus you’ll get to see what Laser Periodontal Therapy is and how it works. To make an appointment, call 619.670.5571 (El Cajon) or 858.748.4802 (Poway) or click here to request an appointment online. Top: Before gum grafting. Bottom: After gum grafting. Exposed tooth roots are the result of gum recession. Gum recession and the accompanying bone loss are the #1 cause of tooth loss in the US. 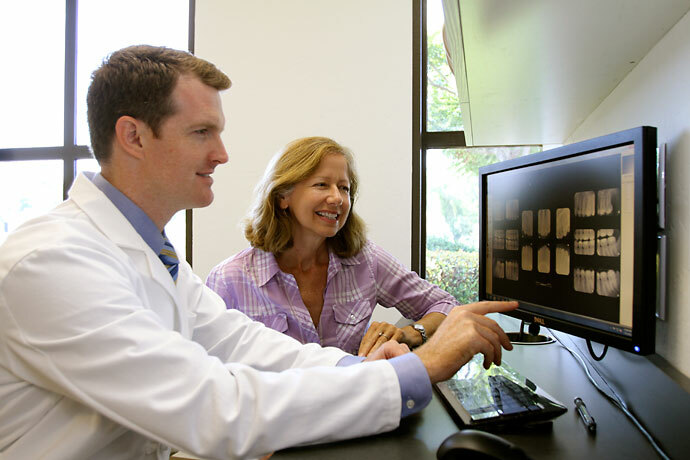 Dr. Henriod performs gum graft surgery to cover roots or develop gum tissue. During gum graft surgery, Dr. Henriod takes gum tissue from your palate or that of another donor source to cover the exposed root. This can reduce continuing bone loss and recession. Sometimes Dr. Henriod can cover exposed roots to protect them from decay. This may reduce tooth sensitivity and improve esthetics of your smile. Learn more about Gum Grafting. When your teeth appear short your smile looks “gummy”. This is most likely not because your teeth are really too short, but they’re covered with too much gum tissue. To fix this this, Dr. Henriod performs a crown lengthening procedure in which excess gum and bone tissue is reshaped to expose more of your natural teeth. This advanced procedure can be performed on a single tooth to even your gum line – or on many teeth to reveal a natural-looking smile. This “gummy smile” was corrected by removing excess gum tissue, leaving more of the tooth showing. Gum disease, the #1 cause of adult tooth loss in the US, is the inflammation of the soft tissue, accompanied by abnormal loss of bone that holds your teeth in place. It’s caused by toxins from bacteria in plaque that accumulate along your gum line. An early symptom of gum disease is a painless bleeding of the gums. 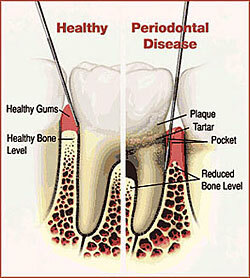 Pain is a symptom of more advanced gum disease as the loss of bone around the teeth leads to gum pocket formation. Also, the space between the teeth and gums eventually becomes bigger. The bacteria then become more aggressive as the space the bacteria are within deepen, causing further bone destruction and the loss of otherwise healthy teeth. To greatly reduce your risk of getting gum disease, be sure to follow our hygienists’ instructions for good oral care. Regular flossing and brushing, combined with a healthy lifestyle plus routine checkups and cleanings, are the most effective ways to avoid gum disease. A deep cleaning may also be recommended by Dr. Henriod, depending upon your situation. Site created by Gilleard Dental Marketing ©2012-2019 Gilleard Marketing. All rights reserved. Custom photographs ©2012-2019 Keith Gilleard and Gilleard Marketing.